Golf Shop opens at 7:30am and closes at 5:30pm. First tee time is 8am. Carts must be returned by 6pm. Twilight Golf will begin at 2pm. Sunday 7:30 a.m. - 5:30 p.m.
DONSAs 7:30 a.m. - 5:30 p.m. 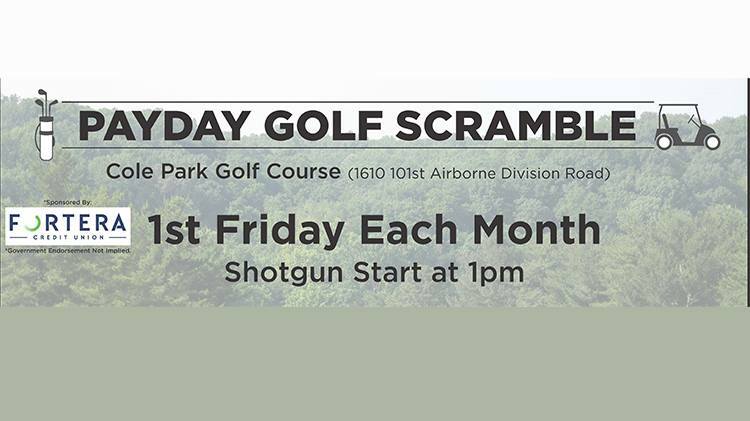 Holidays 7:30 a.m. - 5:30 p.m.
Cole Park Golf Course is OPEN to the public! Welcome to Cole Park Golf Club at Fort Campbell, KY. Cole Park is one of the finest golfing facilities in the Army. Our goal is to provide golfers in our Army community with everything they desire in a top-notch golf facility. From the dramatic course and friendly staff to our practice facilities - we are here to provide you with a terrific golfing experience. Cole Park Golf Club offers an assortment of attractions for Soldiers, Retirees, Veterans and the Fort Campbell community. Our 18-hole championship golf course has a variety of different terrains which challenge all levels of golfers from beginners to advanced. Our experienced staff welcomes the Fort Campbell community to come out and share in the fun of the game. We have an 18-hole Championship course that covers over 350 acres of prime real estate. Built in 1947, Cole Park Golf course features several dramatic changes in elevation during the first eleven holes, and then reverts back to flat terrain on the final seven holes. Bent Grass greens and Bermuda Fairways provides for an excellent golfing experience year-round. Finally, with course yardages ranging from 5,057 yards to 6,843 yards and 4 sets of tees, anyone can enjoy the game of golf on our traditional course! If you want to warm up prior to your round, Cole Park's driving range is the place for you. Our facility offers a driving range with several new target greens, a practice bunker, a renovated chipping green, and a multi-hole putting green. The ball dispenser at the driving range accepts tokens that must be purchased from the Golf Shop. We offer two sizes, a large bucket for $5.00 (approximately 70 balls) or a small bucket for $3.00 (approximately 35 balls). Are you tired of driving ranges that restrict you from hitting woods or only let you hit from mats? Not here. Feel free to let the "Big-Dog" eat at our large driving range which also offers a large grass hitting area to sharpen all aspects of your game. The Golf Academy at Cole Park Golf Course offers a wide variety of state of the art technology to help with all aspects of any golfer’s game. Digital swing analysis is a specialty at Cole Park Golf Course. Digital swing analysis allows students to see their swings and compares them to the swings of today’s top players. This process increases the speed of improvement, which results in LOWER SCORES. Digital swing analysis is offered at Cole Park Golf Course through PGA Master Professional Dave Normand. This highly sought after teacher has been published in Golf Digest, Golf World, USA Today, PGA Magazine, and numerous other golf publications. The combination of digital swing analysis and Dave Normand will improve your game and the quality of your golfing experience. Whether you are interested in forming an organizational outing, a fundraiser, or a competitive tournament, Cole Park Golf Course has the facility, staff, and resources to make your event special. We offer a variety of tournament packages that can include any of the following: scorekeeping, cart signs, award ceremonies, catering, different playing formats, and beverage cart. No more than four players per group; singles or two-somes may be paired up. Proper attire must be worn on the grounds and course at all times. No more than two (2) riders per cart. White Stakes- Out of Bounds. Red Stakes- Lateral Water Hazard. A ball coming to rest on or beyond Lee Road and Bastogne Avenue is out of bounds even though it may lie on another part of the course. All measurements are to the middle of the green. No more than four players per group; singles or twosomes may be paired up. Singles or twosomes do not have priority on the course. Minimum age to be on the course is 7 years old and accompanied by an adult guardian. All ages may utilize the practice areas (Driving Range, Chipping/Pitching Green, and the Putting Green) - age 14 and under must be accompanied by an adult. You must be 15 or older in order to play unaccompanied. MEN: should dress in suitable golf attire. Military uniforms, including PTs, are not allowed to be worn during play on the course. Men’s shirts must have sleeves. Cutoff pants or shirts are strictly prohibited. LADIES: should dress in suitable golf attire. Short shorts, halter tops, tops with spaghetti straps, or other revealing attire is prohibited. Ladies’ shirts must cover midriffs and sleeveless shirts must have a collar. Military uniforms are not allowed to be worn during play. SHOES: must be suitable for playing golf. Boots, lug sole shoes, or metal spikes are not allowed. Players and guests must be at least 16 years of age with a valid driver’s license in order to rent or operate a golf cart. Cart fees are charged on a per rider basis, i.e. each person is charged for a seat in the cart. Non playing riders are charged as well, regardless of age. All food and beverages must be purchased from the golf club facilities. Private coolers are not allowed. In the case of inclement weather, call to duty or emergencies, a credit will be issued for the holes not played. The amount of the rain check will be equal to the fees paid for the holes not completed. For example: if $26 was paid for 18 holes with cart, the fee would be $1.45 per hole. If the player had 8 holes remaining when a storm started, a rain check would be issued for $11.60. If the first three holes have not been completed, the player will be issued a rain check for the entire amount paid. Rain checks will not be issued for slow play. Visit our golf shop! We've got it all: club sets, irons, woods, putters, balls, apparel, accessories, and more. 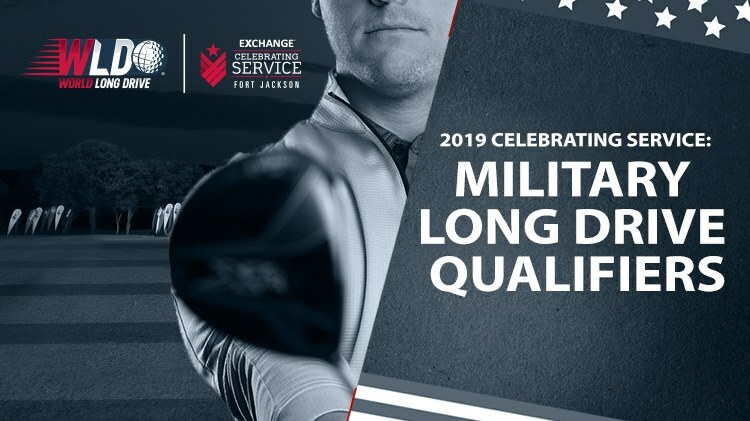 Qualify to compete in the 2019 Military Long Drive Championship.